We are based in Whittington Moor, Chesterfield, Derbyshire. At NT Electrical we offer high standards, reliability, and customer consideration. We also make sure we take every minor detail into account. This allows us to carry out a successful job/project from start to finish. All staff are fully qualified to the latest 17th Edition Wiring Regulations (BS7671) which came into force 2008. Certification is provided for all work completed in accordance with Part P of the building regulations..
We are 100% customer focused -, it's not difficult to see why companies choose NT Electrical Services for their electrical requirements. 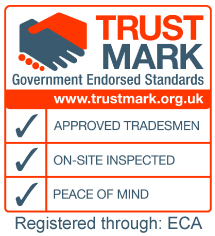 NT Electrical are an ELECSA Approved Contractor, and all work is carried out in accordance with Part P of the building regulations, and the 17th Edition Wiring Regulations (BS7671).